Mahadaji Shinde (3 December 1730-12 February 1794) also spelled as Mahadji Scindia or Mahādajī Śiṃdē, was a Maratha Statesman and ruler of Gwalior in Northern India. He was the fifth and the youngest son of Ranoji Rao Scindia, the founder of the Scindia dynasty. Mahadaji was instrumental in resurrecting Maratha power in North India after the Third Battle of Panipat in 1761, and rose to become a trusted lieutenant of the Peshwa, leader of the Maratha Empire. Along with Madhavrao I and Nana Fadnavis, he was one of the three pillars of Maratha Resurrection. During his reign, Gwalior became the leading state in the Maratha Empire and one of the foremost military powers in India. After accompanying Shah Alam II in 1771 to Delhi, he restored the Mughals in Delhi, under the suzerainty of Marathas. Mahadji Shinde's principal Advisors were all Shenvis. He annihilated the power of Jats of Mathura and during 1772-73 he destroyed the power of Pashtun Rohillas in Rohilkhand and captured Najibabad. His role during the First Anglo-Maratha War was greatest from the Maratha side since he humbled the British in Central India, single handed, which resulted in the Treaty of Salbai in 1782, where he mediated between the Peshwa and the British. In 1787 Mahadji attempted to invade Rajputana but he was repulsed by the Rajput armies at Lalsot. In 1790 he defeated the Rajput kingdoms of Jodhpur and Jaipur in the Battles of Patan and Merta. After the British defeat, Hastings through Murre proposed a new treaty, known as the Treaty of Salbai, between the Peshwa and the British that would recognize Sawai Madhavrao as the Peshwa and grant Raghunath Rao a pension. The treaty also returned to Shinde all his territories west of the Yamuna and so was made to withdraw to Ujjain. A resident, Mr. David Anderson (1750-1825), of St. Germains (who had negotiated the treaty) was at the same time appointed to Mahadji's court. After the Treaty of Salbai in 1782, he invaded and overpowered the Rajput states, particularly Jodhpur and Jaipur through the Battle of Patan, the Battle of Merta. Even Sikh Sardars of the cis-Sutlej region paid tributes to him. Mahadji became Vakil-ul-Mutlaq (regent of Mughal affairs), and the Mughals also gave him the title of Amir-ul-Umara (head of the amirs) in 1784. Another achievement of Mahadji was his victory over the Nizam of Hyderabad's army in a battle. The Nizam state ceased be a factor in the north Indian politics after this battle and it generally confined itself in the Deccan afterwards. After the peace made with Tipu Sultan of Mysore in 1792, Mahadji exerted his influence to prevent the completion of a treaty between the British, the Nizam of Hyderabad, and the Peshwa, directed against Tipu. After the Battle of Lakheri, Mahadji was now at the zenith of his power, when he died, at his camp at Wanavdi near Pune on 12 February 1794. He left no heir, and was succeeded by Daulat Rao Scindia. Keeney, the English biographer of Mahadaji Shinde, has described Mahadaji as the greatest man in South Asia in the 18th century. 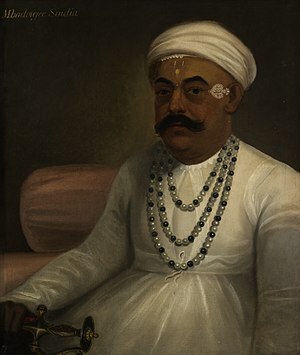 Mahadaji Shinde's role was instrumental in establishing Maratha supremacy over North India. Shinde Chhatri, located in Wanawadi, in Pune is a memorial dedicated to Mahadji Shinde. It is a hall that marks the spot of Mahadji Shinde's cremation on 12 February 1794. The three storied memorial in Rajput architectural style, is one of the most significant landmarks in the city. ^ History Of The Marathas - R.S. Chaurasia - Google Books. Books.google.co.in. 2004. ISBN 9788126903948. Retrieved 26 May 2012. ^ A Comprehensive History of Medieval India: From Twelfth to the Mid ... - Farooqui Salma Ahmed, Salma Ahmed Farooqui - Google Books. Books.google.co.in. 2011. ISBN 9788131732021. Retrieved 21 July 2012. Hunter, William Wilson, Sir, et al. (1908). Imperial Gazetteer of India, Volume 12. 1908–1931; Clarendon Press, Oxford. Neelesh Ishwarchandra Karkare (2013). Shreenath Madhavji : Mahayoddha Mahadji Ki Shourya Gatha. Neelesh Ishwarchandra ( Gwalior). ISBN 9789352670925. Neelesh Ishwarchandra Karkare (2017). Tawaareekh-E-ShindeShahi. Neelesh Ishwarchandra ( Gwalior). ISBN 9789352672417. Wikimedia Commons has media related to Mahadaji Scindia.